Location: Little Island in Waterford City, Ireland. Condition: Restored castle, now a hotel. Notes: Waterford Castle is a historic house on Little Island in Waterford City, Ireland. The house was owned by a branch of the Fitzgerald family for hundreds of years, but was developed into a hotel in the 1980s. The current castle is a Gothic-style house in built 1895 for Gerald Purcell-Fitzgerald (1865-1946) which incorporates the fabric of an earlier (pre-1845) house, and parts of the medieval (pre-1645) tower-house. The designs were prepared by Romayne Walker and supervised by Albert Murrary (1849 - 1924). 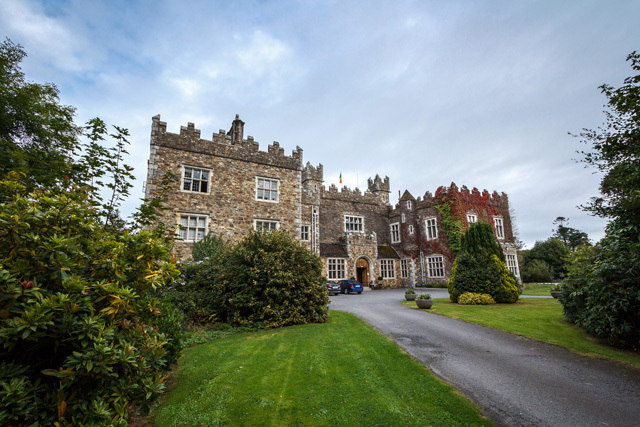 The construction is in unrefined rubble stone with fine cut-stone quoins and window frames and topped with Irish-style battlements.